The ThINKin' Spot: PEACHY KEEN NEWS!!!!!!!! Good morning, my happy stamping friends!! 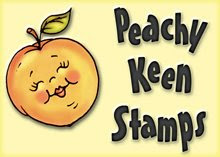 I am so excited to share my news with you about Peach Keen Stamps. I received an email yesterday from Kathy Jakopovich, the owner of Peachy Keen stamps, to let me know that I have been chosen for their Design Team! Wooohoooo!!! Can you say EXCITED?? I quite literally stumbled upon their DT call on Splitcoaststampers, and as I was looking at PK's website, I commented to my DH that their stamps had the cutest little familiar faces, and that I would LOVE to be on their DT to get the chance to work with those stamps, because they are just so darned cute! So, cut to the chase, I gathered my information and sent it to Kathy's email address, because there wasn't much time left to apply. I honestly figured that I didn't stand much of a chance at getting a spot since there were only two positions being filled, and the competition is undoubtedly fierce. I know very well that there are a lot of talented stampers/artists out there. After I got my information sent in, I felt compelled to go back to Peachy Keen's website to look around a little more, becaue I couldn't get it out of my head how familiar the faces on those adorable animals and snowmen looked. As I was surfing around the site, I found the place where Kathy was offering her Paint A Happy Face books, and the light went on! I have been tole painting from Kathy's books for YEARS! I have painted everything from wooden sleds with the adorable "What's So Funny Snowman" to fruit jars, candles and light bulbls with those oh, so cute gingerbread and snowman faces with crew socks on their heads for hats! They are the most adorable little gifts, and always sell so well at our church's Apple Festival/Craft Bazaar. When I finally put it all together, and realized that Kathy was the same lady who had written some of my all time favorite tole painting books, I was even more excited at the possibility of working on her design team. I felt like I had found a dear friend whom I had lost touch with!! Maybe this little story will help you understand why I was so excited to hear from Kathy yesterday! I'm still on cloud nine!!! Peachy Keen Stamps will be holding the GRAND OPENING of their new challenge blog on Tuesday, June 30th. Please drop by, sign up to follow (have the chance to win a fabulous prize), play along, and help welcome them to the wonderful world of blogging. It's all still a pretty new experience to me, but I have to say that I have met some of the most kind, caring, and wonderful people in my life through blogs and blogging, and I know that this experience will only become more of a blessing as I continue the journey. To Kathy, and everyone at Peach Keen Stamps... Thank you very much! I am thrilled to have this opportunity, and I look forward to a wonderful, creative journey representing Peachy Keen Stamps! Thank you for stopping by today, and I hope your day is filled with people and things that you love! May our good Lord bless and keep you! Woo Hoo!!! Congratulations, Lorie! Peachy Keen stamps is lucky to have you on their design team... you are an incredibly talented woman!!!!!!! congratulations to you, you are going to be happily busy with your DT work, I wish you much success! Thank you for visiting my blog and the knid comment. Hey there!!! Congratulations!!!! Kathy is very lucky to have you on their DT! You will have so much fun! Cannot wait to see what you create! So pleased to 'meet' you fellow DT member! looking at your blog, it's easy to see why you were chosen! Your projects are gorgeous. I look forward to working with you and the other DT members. (I'm so excited). Whooooo hooooo!!! This is such great news and you are so deserving, Lorie! You will be a brilliant addition to their team and I can't wait to see your talent applied to their adorable images. Congrats! Congratulations!!! I am so happy for you. You are gifted..
You are in "hot" demand which is only fair since you are great at what you do. I saw the little peachy keen thing on you blog before you let everyone know you were selected. They got one of the best - if not the best - person to design for them. Congrats Lorie!! Oh my goodness, Lorie!! That is so so so cool!! I'm so excited for you and so stoked to say I knew you when! Tammy's coffee and tea swap...WOW! Congratulations Miss Wonderful Lorie! You deserve it and they deserve you! Yay, Lori! Gratz! I've always said, and heard said by the other ladies in Stamp-a-licious Stampers, that you were a true artist. It is great that you are getting this recognition! I can't wait to see what you do with their stamps. CONGRATULATIONS with a giant Capital C! You so deserve this, you're such a talented lady! And good on Peachy Keen for recognizing that! THey are lucky lucky to have picked you up! Wow! Yippee!! Hooray!!! Way to go, Lorie!!!! I'm so delighted for you and know that this is a well deserved honor. I feel blessed to have received some of your beautiful cards so I'm not surprised that Peachy Keen picked you for their design team.